The photos in this reportage are available for publishing by contacting travel and adventure photographer David Seri. When the crater of a volcano is very large, then the volcano is called a boiler (caldera in spanish). 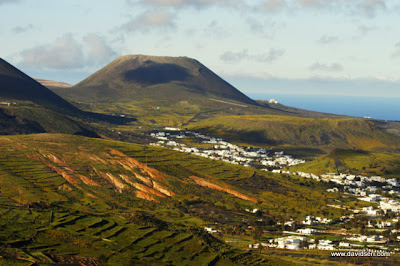 The Caldera Blanca boiler is the biggest one in Lanzarote with 1200 meters in diameter. What makes this ancient volcano boiler unique is that its color is white. The sea of black lava with the white volcano Caldera Blanca in the distance. Dirt roads From Tinajo take you across rivers of solid lava to get the edge of the volcano. It only takes about 30 minutes to go up and down to the top. The view of the crater from the top. Lava used to boil in there. Walking around the ridge takes about 1 hr. View of the crater from the highest point with goats roaming around. These photos are available for publishing by contacting portrait photographer David Seri. Carlos Morales Quintana is the arquitect of the new Congress Hall of Lanzarote. Portraits and photos working in his studio. Click on any of the photos to see more photos of the same photo shoot. Contact David Seri for publishing these or other photos.